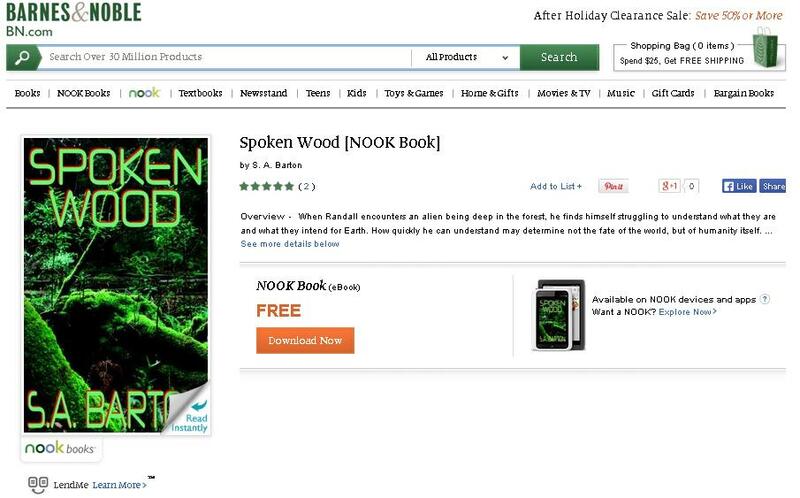 When Spoken Wood first arrived at Barnes & Noble, a glitch somewhere along the way robbed it of its (I think) vibrant cover. Some of you still downloaded copies, and two of you were nice enough to leave me very complimentary reviews. Thank you! But you may not have gotten your cover art. Go back now and get it, the issue is fixed! And if you haven’t read it… what exactly are you waiting for? Go get it. If B&N isn’t your favorite, it’s available at all of the places in the right sidebar under ‘Buy My Books’ with the sole exception of Amazon.